Covering the Wakefield area as City & Guilds accredited locksmiths for the last 30 years we can promise you a reliable, efficient, and reasonably priced service from our team based on Westgate End. Avoid national locksmith companies who claim to be local - deal with a genuinely local, friendly locksmith company. We've been on Westgate End for over 20 years! We carry a huge range of stock which means we are often able to change your locks like-for-like on our first visit – often upgrading them to higher security locks at the same time. We carry a huge range of uPVC spares and repairs and can often replace the offending part on our first visit. Save £100s by getting us to repair! Don't replace the whole door or window! Prevention is often better than the cure – we highly recommend any property owner with uPVC doors ensures they have snap safe cylinders fitted. We carry a huge range of snap safe cylinders with the highest security and insurance ratings – we can also offer keyed alike suites and bulk quantity discounts. If you've just moved house, or you need to change your locks for security reasons - we can replace them the very same day. Whether you are locked out of your property, or just want to change your locks we can help. uPVC windows and doors can often break meaning that you are unable to open / close or even lock them at times. The most common method of break in is through the cylinder on the uPVC door. We can upgrade your locks to the latest snap safe high security cylinders. I am much appreciated with the excellent work done by Danny Ansell for the replacement of door locks at our house today 26May18. Moreover, I am also impressed by his professional manner and patience in explaining to me about the details. Thank you very much Dan. Being a non-trades person I was very happy that the information provided and the subsequent sale was 100% correct. I would certainly recommend. After our uPVC door lock became faulty I contacted these guys to come out and take a look. Door fixed and lock upgraded all within the same day for a very reasonable price. Great service. All of our locksmiths have been trained in-house and have years of experience. We offer a full 12 month labour and parts warranty on our work. We're available day and night - just call our friendly team who will be happy to give you an honest quote and advice over the phone. We're a local company and can often be within you in under an hour. We also have a huge range of stock in our Wakefield based shop should we require additional parts. 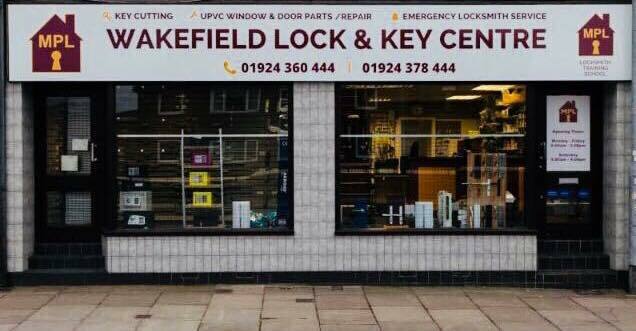 Here at Wakefield Lock And Key Centre we have been offering a locksmith service throughout the area and the whole of West Yorkshire for over 30 years. We pride our selves on our high level of service and workmanship. We often get most of our work through word of mouth and customer recommendations - so we like to think we're doing something right. Whether you're a home owner or a business owner - we can offer you the right services, at the right price. Why not call us today and see what we can do for you, or fill in the email enquiry form to the left?